Much has been said about the Indian Aerospace and Defence sector and the plethora of opportunities it presents in the form of a reasonable amount of deals that have already been signed with major global integrators, and a considerable number in the pipeline. 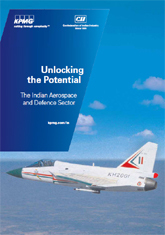 This paper is a look at the factors responsible for a successful aerospace and defence sector in any country, the global best practice in terms of these factors and Indian performance as measured by the capabilities in these factors. It further goes on to draw out what needs to be done in India to best leverage its potential and become a global name in the industry and what needs to be done by each of the stakeholders.